I bought the cheaper Cold Steel kukri over a decade ago to use on backpacking trips, it came with a cheap nylon sheath. I chopped down standing dead wood, bucked trunks, and split kindling with it on several outings. It just worked. It’s not a weapon to choose for battle but it was a fun diversion and something different from the normal camp hatchet. I strapped it to my backpack for the hike, and don’t recall ever hanging it from my belt other than possibly while gathering firewood. I had a similar experience, two cold steel kukri that my son and I used to clear overgrown landscaping from a recently purchased home, they worked great and we had fun clearing a ton of stuff. 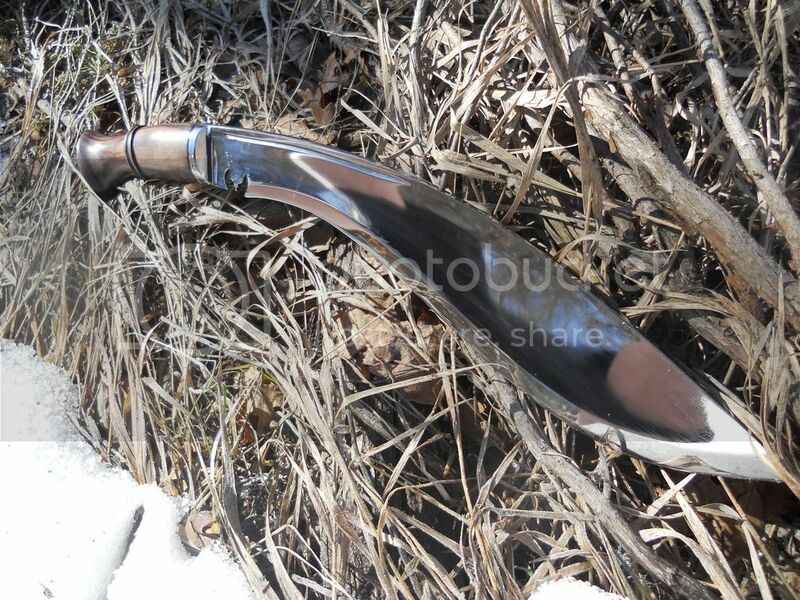 Another option would be www.torablades.com Simon Hengle is the owner and they make their khukuri based on the older fighting models from World War I and World War II. 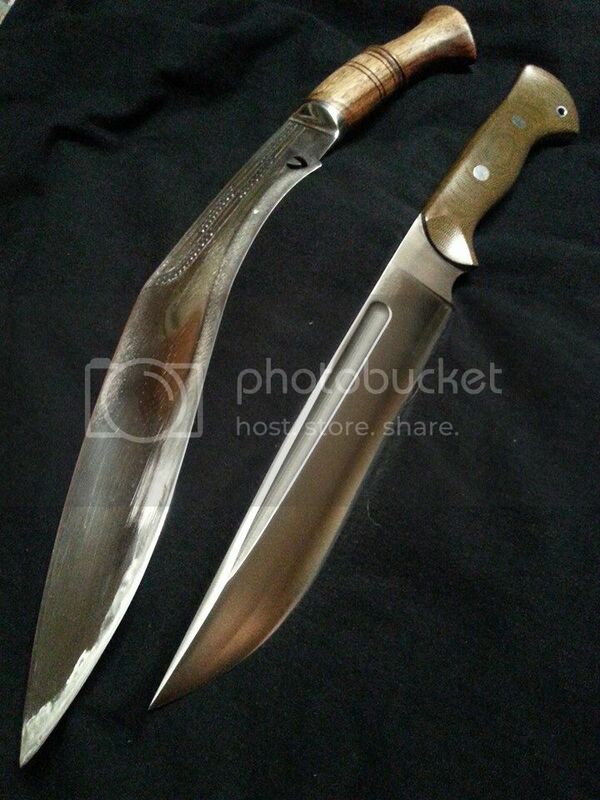 While it can take quite a while for their khukuri to ship, the quality of their traditional khukuri are top notch. I own both a tin chirra and an MK1 model from them and recommend them highly. I agree completely on the Tora Blades kukris. I've got a decent collection of Nepalese kukris by various houses, and Toras are the kukris that are most likely to be built to mimic real kukris from the WWII era and earlier. Most other tourist kukris from other houses are way overbuilt, heavy to the point they are hard to carry without pulling your pants down, have overly thick edge geometries, and just don't work as well as you'd hope. It's not the Nepalese kamis fault that most kukris are built that way. They're just catering to the world market that thinks it needs sharpened prybars for bushcraft. Some other kukri houses have a selection of lighter models. I like many of Himalayan Import models, for example, but my HIs are pretty heavy, and I go for the light ones usually. Thamar Kami is the smith that makes the best of the HI kukris, IMO, and he tends to make them around 26 oz, which is pretty heavy for a 12" bladed kukri. The Toras, OTOH, are all light enough to carry on the belt and work as a kukri is intended--as a weapon and light duty machete-type blade. Even the biggest ones only average around 24 oz or less. My BSI, which has a 12" blade, weighs in at 16oz, which perfect for a fighting blade, and it still does a good job as a light machete, being 1/4" thick at the bolster and tapering to nothing at the point. The others range between 19 oz. on my Kirante Sirupate, 22oz on my Mk2, up to the 14" bladed, 24 oz. FW Mk1. All of mine are working blades. Tyranny, like hell, is not easily conquered. Yet we have this consolation with us, that the harder the conflict the more glorious the triumph. What we obtain too cheap we esteem too lightly. I have found the Tora blades to be more in line with the fighters. Although some of the pre WW1 fighters are quite heavy. The HI tend more toward the utility khuks. You can beat the snot out of them and they keep ticking. I have been able to put a shaving edge on the HI khuks, so despite the heaviness the edge geometry is reasonable.